You asked for it, and we’re delivering. 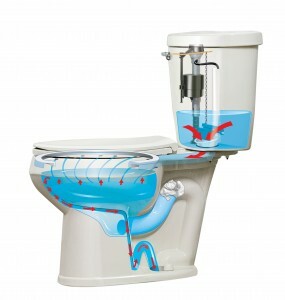 Mansfield Plumbing is proud to launch the new PROTECTOR® No-Overflow Toilet! How does the PROTECTOR work? Even if the toilet is clogged, a unique concealed secondary drain provides overflow protection that directs excess water into the drain line. In addition to solving the “clogging overflow dilemma,” the PROTECTOR stays clean longer. The unique PuraClean™ glaze on the toilet makes the bowl bacteria resistant and easier to clean. Available as a SmartHeight™ toilet, the 1.6 Gpf PROTECTOR sits 16-1/2″ tall and meets ADA standards, making it easy to sit and stand from this easy-access toilet. Now you can have comfort, peace of mind and easy cleaning all in one toilet — the PROTECTOR!